"Peg Leg Howell was a forgotten, impoverished blues artist when musicologist George Mitchell recorded him at age 75 in 1963. 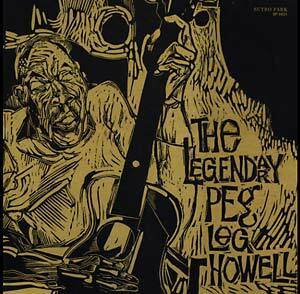 It is these recordings that make up The Legendary Peg Leg Howell record, originally on Testament. But Peg Leg was actually part of the original wave of blues recording artists, recording for Columbia in 1926. His story is like many: when success proved elusive, he turned his back on music and settled for bootlegging and other types of work until rediscovered in the '60s. By then, he was old and fragile: qualities that translate beautifully on this quiet, haunting record that would be the bookend to a recording output that was tragically small but truly rich. The Legendary Peg Leg Howell is a sonic novel, filled with storytelling, drama, history and sadness. Hope and compassion. It is a classic. Reissue includes amazing front cover woodcut of Peg Leg." Pressed on 180 gram vinyl.